Why offer energy career perks? At Exchange Utility, we pride ourselves on our commitment to team member wellbeing and on providing some of the best energy career perks in the industry. With the rapid expansion of our team over recent years, we have made it our objective to implement measures that keep our staff happy, maintain our family value orientated culture and benefit those involved in our organisation – both inside and outside of working hours. We’re proud of the progress that we have made so far in this area. Offering energy career perks has resulted in us being able to attract and maintain the best talent in the industry, from both the local area and further afield. What energy career perks do Exchange Utility offer? We offer a fantastic package to those looking to embark upon an engaging career in business energy. We do this because we believe that a happy workforce is a productive workforce – We have yet to be proven wrong! Each benefit that we offer has a positive effect on staff as well as the business, so for any budding businesses looking to create a truly enjoyable employment experience, listen up! 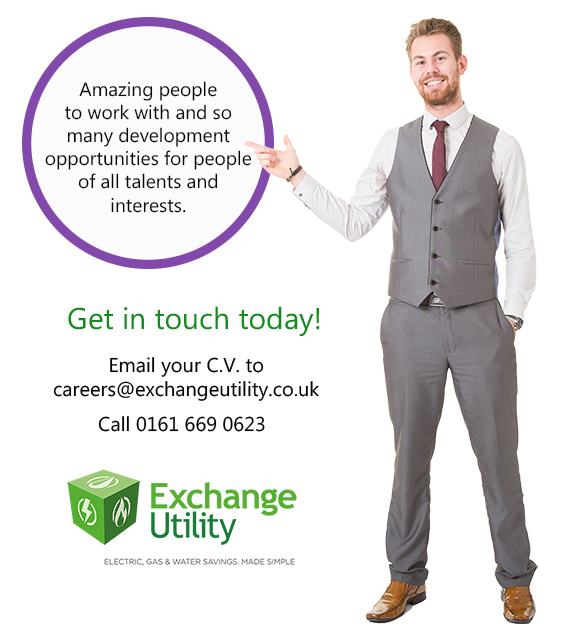 Get these energy career perks, apply for your new role with Exchange Utility today. What additional energy career perks will Exchange Utility be offering this year? It’s already looking like it’s going to be an exciting year. We have lots of plans for expanding and engaging our workforce more than ever before! This is going to require a LOT of energy! That’s why we’re pleased to announce that we have partnered with local gym Anytime Fitness Bury, so that we can facilitate our team members with a way to relieve tension and enjoy their spare time that little bit more. To aid us in getting started, Anytime Fitness Bury, are offering all Exchange Utility staff members who wish to pursue a full membership with the club, EXCLUSIVE access to special Exchange Utility staff membership rates. All Exchange Utility employees receive a corporate membership rate of £27.99 per month. “In my experience it’s very important for health clubs to support people in the workplace and get more people active. It is known that there is less sickness in the workplace when more of their employees are keeping fit and healthy. Want to enjoy the energy career perks of working with Exchange Utility? JOIN US! We have plenty of roles available for those looking for their next challenge. We have so much to offer, why don’t you take advantage of it?